Stonewall Gazette: Black and Gay is Beautiful! Black and Gay is Beautiful! 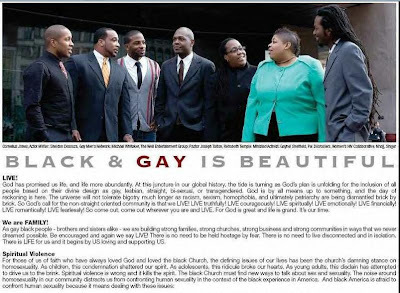 Full Page Ad Responds to McClurkin: "Black & Gay is Beautiful" reports Rod 2.0. "Black gay activists take out a full page advertisement in response to Donnie McClurkin's hateful "ex-gay" and 'anti-gay" rants. The advert runs in today's Metro NY. Pastor Joseph Tolton of Rehoboth Temple wrote the official response on behalf of New York’s black gay men and counters the "hypocrisy in the pulpit" and "spiritual" violence of McClurkin and homophobic black churches."